The 2018 Major League Baseball trade deadline will be remembered for just how many selling teams there were, and the various prices that were paid for "rental" players. By rental players, we mean players with contracts that are expiring at the end of the season. Of the many "rental" transactions we've seen, the trade of third baseman Mike Moustakas to the Milwaukee Brewers may be one of the most interesting. The "Moose" on the move! Mike Moustakas was traded to the Milwaukee Brewers by the Kansas City Royals late on July 27, 2018. The return was outfielder Brett Phillips and right-handed pitcher Jorge Lopez. What's interesting about the return is unlike many other rental trades, these are not minor leaguers with upside, but rather once highly-thought of prospects that have already graduated to the Major League level. Of course, neither Phillips or Lopez has lived up to their billing. The "Moose" has had a fairly good season for the Royals, even though he has a rather ugly batting average and an on-base percentage around .300. His power output is about what we've come to expect and his defense at third base is solid if not spectacular. His baserunning has been dismal, but not unexpected. But, on only a $5.5 million contract for the season, plus a $1 million buyout on a mutual option that will quite likely be declined by the player, the Brewers are assuming minimal financial risk. BUT, don't the Brewers have a third baseman? Before we get to the return for the Royals, which is quite interesting itself, let's talk about the implications of the Brewers acquiring Moustakas. The power of Moose's bat is quite welcome. The issue is that the Brewers already have a fine third baseman in Travis Shaw. Of course, Shaw can reliably handle first base as well, but the Brewers have a fine first baseman already in Jesus Aguilar. So, where do all the pieces fit? The trouble with the Brewers is second base. They've gotten well-below average production from the position in 2018, with Jonathan Villar leading the way as a below-average hitter. But it's highly unlikely you would see Moose playing second base. That leaves only Travis Shaw to be on the move to the keystone. While Shaw isn't your typical second baseman, he's shown defensive versatility in the past. So, we'll see how the Brewers' creativity works out. As a team trying to win the National League Central, solidifying their power output at the cost of a few potential runs on defense seems like a good trade-off, especially as Moose is fine at the hot corner. We'll see how Shaw actually fares at second for the rest of 2018. But, on paper, this is a move the Brewers really needed to make. What About the Guys the Royals Got? Once a top prospect, Brett Phillips did fine in his first MLB action in 2017. But in 2018, he's struggled. He's even been below average at AAA with the bat. He's fine defensively, though, actually above-average. He had 8 Defensive Runs Saved in only about 200 innings in the outfield in 2017, and 2 DRS in only 42 innings in 2018. So, if he hits anywhere near league average, he's going to be a useful outfielder for the Royals. He's still only 24 and has years of control left. Jorge Lopez has shown potential in the past, although like Phillips, he's had a down 2018 with only a few appearances in the Majors. But this is a guy who throws in the mid-90's with his fastball, has a good curveball, and a serviceable change-up. Whether he becomes a fourth or fifth starter or just a middle reliever for the Royals remains to be seen, but he needs to get the walks under control. Really, if the Royals end up with a fourth outfielder and a middle reliever for two months of Moustakas, they made out pretty well. The Moose gets to be in a pennant race and potentially set himself up for a nice contract in the offseason. For the Royals, they shed a few dollars in payroll and receive two players that can play on the Major League team right now. Phillips could still be a starting outfielder and Jorge Lopez could still be a useful pitcher for them. The Brewers weren't really going to miss them, but when you're a team that's doing as poorly as the Royals, any controllable reinforcements are always welcome. Dan Quisenberry, better known as "Quiz," was an ace relief pitcher for the Kansas City Royals for 10 seasons (1979-1988). During that time, he compiled 24.9 WAR, for an average of nearly 2.5 WAR per season, an incredible feat for a relief pitcher. Then again, during the eighties, relievers often pitched over 100 innings a season. Quisenberry was the Royals designated closer for 5 of those seasons, compiling at least 33 saves in each of those years and topping out with 45 in 1983. He saved 37 games for the World Champion Royals in 1985. Quisenberry was a three time All-Star, being selected in 1982, 1983, and 1984. His best season was in 1983, when he compiled 5.5 Baseball-Reference WAR, saving 45 games with a 1.94 ERA in 139 innings. His tough arm angle and devastating sinker made up for the fact that he rarely struck out any batters (3.3 K/9 career). He didn't walk too many batters, though, either (1.4 BB/9 career). He also didn't give up many home runs (only a 0.5 HR/9 career mark). He started burning out in 1988. That year, the Royals decided to release him after 20 only OK games. The Royals knew something was up, because when he signed later that season with the Cardinals, he was awful, posting a 6.16 ERA in 33 games (-0.7 WAR). He recovered a bit in 1989 for the Cardinals, however, when he posted 0.9 WAR in about 78 innings. But in 1990, he got into only 5 games with the Giants. In most of them, he was bombed. That was the career for Dan. While Quisenberry isn't a Hall-of-Famer, he had quite a great career as one of the best relief pitchers of the 1980's. He was a part of the truly great Royals teams of the 80's and was a kind of pitcher we may never see again. Also, he's a published poet! Sadly, Quisenberry passed away in 1998 of a brain tumor. He left behind his wife Janie and two children. His wit and humor will be greatly missed, but he left behind a lot of great memories. How Much is a Dan Quisenberry Baseball Card Worth? The one Dan Quisenberry baseball card that's worth a fair amount is the 1980 Topps Future Stars #667 card that he shares with fellow Kansas City Royals pitchers Renie Martin and Bill Paschall. This would be considered Quisenberry's rookie card. Renie Martin would only have one good year in relief in 1981, but was worth -1 WAR in his short 6-year MLB career. Paschall pitched in only 11 major league games. Still, because Quisenberry had a notable career, this card can go for $40 to $50 when graded by PSA in Gem Mint 10 condition. You can find the card in good shape ungraded for as little as $2, however. Other Dan Quisenberry cards such as his 1982 Topps, 1983 Topps, and 1984 Donruss issues do pop up for sale occasionally in graded PSA 10 condition. Unfortunately, due to being fairly common and because Quisenberry isn't a Hall of Famer, these cards typically don't sell for much more than $10-12. Still, if you're a Kansas City Royals collector, these are nice cards to own for your collection, even if they don't hold much value. Eight games. Eight wins. The Kansas City Royals have won every single game that they have played this postseason: the Wild Card Game against the Oakland Athletics, three straight games against the Los Angeles Angels in the American League Division Series, and now four straight against the Baltimore Orioles in the American League Championship Series. After winning Game 4 by a score of 2 to 1, the Royals are going on to their third world series in team history, and their first since their victory in 1985. That team included the likes of George Brett and Bret Saberhagen. Most people expected some resistance from each the Angels and the Orioles, but the Royals extremely underrated pitching staff – which carried them to 89 wins during the regular season – came through when it mattered most. Of course, the bullpen trifecta of Kelvin Herrera, Wade Davis, and closer Greg Holland was a bit part of why the Royals won all of these games. Anytime you only need six solid innings from your starter, and you go into the seventh inning with a lead with those guys in the bullpen, you’re not going to lose many games. Most people picked the Orioles to win this series, but you can’t win any series without producing offense. As Pedro Martinez pointed out in the TBS pre-game show, the absences of Chris Davis, Manny Machado, and Matt Wieters – three of their best hitters - truly did show when their line-up needed them the most. Machado and Wieters suffered season-ending injuries early on, and Chris Davis was suspended late in the 2014 season for the use of amphetamines – after already not having one of his better years. It helps that the Royals had some offensive stars during the postseason on a team that isn’t known for their hitting prowess. Eric Hosmer led the way with a 1.370 OPS coming into today’s game (.462/.563/.808) with two home runs and seven runs batted in in 26 at-bats. But it’s been team speed (13 stolen bases in the post season against only 3 times caught stealing) that’s been the big difference. Also, the Kansas City defense, though it committed over 100 errors during the regular season, have shown their true prowess throughout the series with outfielders Alex Gordon and Lorenzo Cain and shortstop Alcides Escobar leading the way with fantastic plays. While the Orioles were basically in every game, the Royals bullpen was simply too much. As the TBS commentators pointed out at the clinching game’s conclusion, power pitching beats power hitting, and the meat of the Royals bullpen is all power. The Orioles lost Game One 8-6 (in a surprising slugfest), Game Two 6-4, and Game Three 2-1. Every game was decided by two runs or less, an area which is something that the Royals have excelled in all season. At this time, Game 4 of the National League Championship Series between the San Francisco Giants and the St. Louis Cardinals is yet to be played. Both would make a great matchup for the Royals who will be opening the World Series at home in Kauffman Stadium, due to the American League winning the World Series home field advantage during the 2014 All-Star Game. The Royals definitely look like the team to beat this year, and after I picked the Orioles to win in six games, I really find myself with no choice but to ride the hot hand and pick the Royals in five. The Royals are the team of destiny. Now they just have to #takethecrown. The Kansas City Royals Won? For many years I have enjoyed the game of baseball. 2014 was not a great season for me. The local Red Sox were horrendous, but I kept following how the league was unfolding. While I expected the Seattle Mariners would make a little playoff run this year, the other team that surprised me was the Kansas City Royals. The Royals haven’t made the playoffs in 28 years, since before I was born. That all changed when they met the Oakland Athletics at Kauffman Stadium for last night’s American League Wild Card game. The winner would face the Los Angeles Angels in Anaheim on Thursday night. Unfortunately, I didn’t get to watch the game on TV and by the time the TV was available for me to watch it, the A’s were up 7-3. Former Red Sox player Brandon Moss hit two home runs and drove in five runs early on, and it looked like the Royals had played a long, hard-fought season for naught. But I had a strange feeling that the Royals had a rally in them, but it was eleven o’clock Eastern time and I decided to just go to bed. I somehow knew when I woke up this morning that it was going to be the A’s going home. That’s precisely what happened. I went to bed during the top of the 8th inning. The Royals tied the game in the bottom of that 8th inning. There were a couple of fluky things that happened, but really, it was just a team that wanted to win more than the A’s did. Imported ace Jon Lester was pitching into the eighth and was lifted for ace reliever Luke Gregerson. But Gregerson apparently forgot where the catcher’s glove was and a wild pitch allowed the Royals’ Eric Hosmer to score and make it a one-run ballgame. With the score 7-6 going into the bottom of the ninth, the A’s brought in closer Sean Doolittle who would blow the save and the Royals would tie it. It then went into extra innings, with the Royals’ Wade Davis, Greg Holland and rookie Brandon Finnegan holding the A’s scoreless into the 12th. Finnegan ran into some trouble and Jason Frasor unsuccessfully tried to bail him out. The Royals went to the home half of the 12th down 8-7. But the Royals had one last rally in them, not only tying the game again, but winning it on a walk-off hit by the Royals star catcher, Salvador Perez. It was a fitting end to what was one of the best playoff games in a long time. The A’s had held onto the American League West division lead for a long time before mediocre play after the All-Star break in July and an epic collapse in September almost took them out of the playoffs entirely. The Seattle Mariners almost overtook them and up until the last couple days of the season, it looked as if the Mariners would be meeting the Royals for the Wild Card Game. But the Angels defeated the Mariners on the last day of the season, so the Mariners were eliminated. And now the Royals, with their gritty play, strong bullpen and timely hitting have sent the once AL West darlings home to reflect on their woeful end. Meanwhile, the Royals enjoyed the Detroit Tigers not being as strong as they were expected to be and actually enjoyed a short while in first place in the American League Central. The Tigers rebounded late in the season to regain their division lead but the Royals kept playing well enough to hold onto one of the coveted Wild Card spots, and actually finished with a better record than the A’s (89 wins to 88 wins) which netted them the all-important home field advantage. While I will be rooting for the Baltimore Orioles, who have easily become my second favorite team in baseball over the past few seasons, the Royals intrigue me. Of course, the Orioles will be taking on Detroit, so it’s easy for me to root for the Royals against the Angels. It would be pretty awesome to watch the unlikely division winner Orioles take on the major underdog royals in the American League Championship Series. It gives me a reason to watch; that’s for sure. Part of me really wants me to see the Royals go all the way, though. Did Lorde’s Ella O’Connor give the Royals an unexpected blessing after admitting that her song was in fact inspired by the Kansas City ball club? Probably not. The Royals just got leads and never gave them up and piled up 89 wins, a much higher number than anyone could have anticipated. They finished only one game back of the powerhouse Detroit Tigers. Yeah, the regular season doesn’t matter anymore, but if the way the Royals played last night is any indication, the Royals are ready to win, and win it all now. 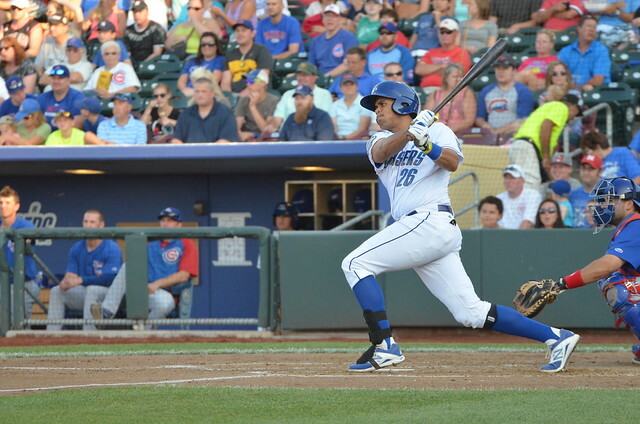 Today, the Kansas City Royals signed Francisco Pena. Being a minor league free agent who's never really hit at any level, Pena does have a good defensive reputation and has thrown out plenty of attempted base-stealers in the past (30% in 2013). Ordinarily, a guy like Pena would get a minor league contract with an invitation to Major League spring training. However, because of the dearth of good catching on the free agent market, the Royals gave Pena a Major League contract, adding him to their official 40-man roster. It's unknown what he's guaranteed besides the usual 40-man roster bonus. Pena is the son of former Royals Manager and current Yankee bench coach Tony Pena, a fantastic defensive catcher himself, so he certainly has the pedigree. He'll battle with Brett Hayes and George Kottaras for the back-up catching job in Kansas City behind Salvador Perez. It is important to note that Perez has had trouble staying healthy, so the backup catcher job actually is quite important for that team. Kottaras is a patient guy with some pop and Hayes just has some pop. It should be an interesting position battle to watch come Spring Training.